Space missions can continue to collect data, but thousands of federal researchers are forced to stay at home without pay. Karen Osborn was supposed to be exploring hidden worlds in the Turks and Caicos, cataloguing the mysterious creatures that thrive in pools connected to the ocean by deep underwater caves. But instead of barcoding blind crustaceans on a trip she’s planned for six months, the marine biologist is stuck at home in Fairfax, Virginia. Osborn is one of roughly 800,000 US government employees who are legally barred from working, and are going without pay, during the federal shutdown that began on 22 December. Because her position at the Smithsonian Institution’s National Museum of Natural History in Washington DC is classified as “non-essential”, Osborn cannot do field research, access her lab or even check her work e-mail until politicians reach a deal to fund the government. While her collaborators from the Woods Hole Oceanographic Institution in Massachusetts and Texas A&M University in College Station collect data in the Turks and Caicos, Osborn is spending time with her family — and waiting for bittersweet updates from the Caribbean. As the shutdown hits the two-week mark with no end in sight, its effects on science have begun to compound, leaving many government researchers weary, worried and demoralized. The National Science Foundation (NSF) has suspended reviews of grant proposals indefinitely, and is likely to delay panels scheduled to judge applications for postdoctoral fellowships in early January. The National Oceanic and Atmospheric Administration (NOAA) has taken widely used weather and climate databases offline. And at NASA, the shutdown threatens to disrupt preparations for upcoming spacecraft launches. There is little sign of progress in budget negotiations between President Donald Trump and Democrats in Congress. The current shutdown — the third of 2018 — began after stopgap funding for 75% of the government expired. Politicians on Capitol Hill are split down party lines over Trump’s demand that any spending deal include US$5.6 billion to construct a wall along the US border with Mexico. The number of employees who have been furloughed — ordered to stay at home — during the shutdown varies by agency, depending on which activities the government has deemed necessary to protect life and property. Just 60 of the NSF’s roughly 2,000 employees are considered “essential” and have been kept on the job, whereas about 5,500 of NOAA’s 11,400 employees are still working; many are weather forecasters. 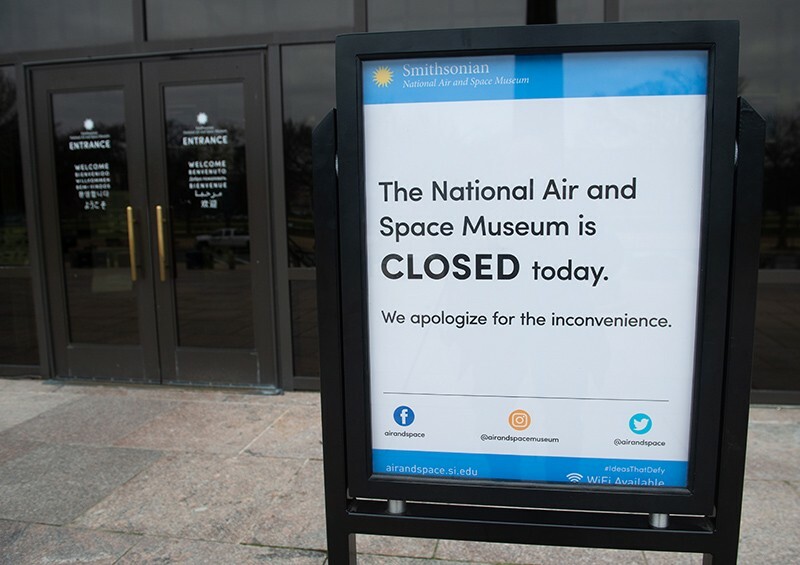 And a few lucky science agencies have escaped the shutdown turmoil. The National Institutes of Health and the Department of Energy are unaffected, because Congress has approved funding for them until 30 September, the end of the 2019 budget year. About 59% of the Food and Drug Administration’s (FDA’s) 17,000 employees can work during the shutdown — in part because about one-quarter of the agency’s budget comes from fees paid by companies submitting drugs or medical devices for approval. The FDA can rely on user fees already collected to keep some programmes going, but it is barred by law from accepting further fees until the government reopens. If the shutdown continues for long enough, the agency could be forced to send more workers home, says Ladd Wiley, executive director of the Alliance for a Stronger FDA in Silver Spring, Maryland. “We’re moving into fairly unprecedented territory if this goes beyond a couple of weeks,” he says. Other agencies have tried accounting tricks to minimize disruptions. The Environmental Protection Agency (EPA) had enough money on hand to stay open until 28 December, but it has now furloughed about 14,000 of its employees, leaving just 753 “essential” workers on the job. That could hamper the EPA’s ability to meet legal deadlines later this year for safety assessments of about 40 chemicals. The agency has already postponed at least one upcoming advisory-committee meeting related to the work. Tracey Woodruff, a former EPA official who studies children’s environmental health at the University of California, San Francisco, says that some of her colleagues are waiting for the agency’s verdict on their applications for grant funding — decisions that have now been postponed indefinitely. Each day of the shutdown “is just another day of delays and another day of people being exposed to toxic chemicals”, she says. At NASA, space missions are continuing to explore the Solar System. The Mars InSight lander that touched down on the red planet in November is beaming data back to Earth, and its raw images are being posted on the space agency’s website. But if the Hubble Space Telescope experiences technical problems, as it did in October when one of its gyroscopes malfunctioned, attempts to address it will probably be delayed because crucial NASA personnel have been furloughed. Organizers of several major conferences are scrambling to replace whole fleets of government researchers who were set to present their work or lead discussion panels. The American Astronomical Society expects that 10–15% of the 4,200 people who registered for its meeting in Seattle, Washington, from 6 to 10 January will be unable to attend because of the shutdown, says Kevin Marvel, the society’s chief executive. They include the AAS’s immediate past president, Christine Jones, an astronomer at the Center for Astrophysics in Cambridge, Massachusetts, which is run jointly by Harvard University and the Smithsonian Institution. Another Smithsonian astronomer, David DeVorkin of the National Air and Space Museum in Washington DC, is supposed to give a plenary talk at the meeting; plans are being made to find a replacement. The AAS is looking for ways to lessen the disruption to its meeting, Marvel says, such as webcasting plenary sessions and allowing non-government researchers to give talks on behalf of their federal collaborators. And the American Meteorological Society is soliciting volunteers to replace government researchers who are scheduled to lead sessions or unveil findings at its meeting in Phoenix, Arizona, from 6 to 10 January. The society estimates that roughly 800 federal scientists, mostly from NOAA, have registered for the 4,300-person meeting. Then there is the Plant and Animal Genome meeting set to take place in San Diego, California, from 12 to 16 January. Many of its organizers and presenters are USDA employees. The meeting gives experienced researchers opportunities to vet potential PhD students and find collaborators, and students a chance to network. But many federal scientists are grappling with more existential worries. No government employees at affected agencies are being paid during the shutdown — even those who have been deemed essential, and ordered to keep working. Congress has historically passed legislation authorizing retroactive pay after a shutdown ends, but that is cold comfort to many federal employees trying to survive without a regular salary. Some financial institutions that serve government employees are advertising special programmes to aid government workers. “Need assistance during the federal shutdown? We’re here to help,” reads a banner on the website of the NASA Federal Credit Union. Osborn, the Smithsonian marine biologist, has given up hope that she will make it to the Turks and Caicos for any of her planned fieldwork this month. Now, she is starting to worry about whether the shutdown will linger for long enough to interfere with an even more expensive, logistically difficult trip to northwest Africa that she has planned for early February. Osborn and her colleagues intend to pilot a crewed submersible around underwater cliffs off Cape Verde, at a time of year when the ocean is calm enough to allow them to search for deep-sea animals.